Theresa May is today poised for a head-to-head with Nicola Sturgeon amid escalating tensions with the Scottish Government over her Brexit divorce deal. The first minister’s office confirmed last night that talks are scheduled while she is London. As she headed south, the SNP leader said it was a time for “grown-up responsible governance in the public interest”. But Scottish Secretary David Mundell accused her of seeking a no-deal Brexit as a way of furthering her independence agenda. EU 27 leaders will meet on Sunday to endorse the draft agreement ahead of a so-called “meaningful vote” in the Commons next month. News of the anticipated Downing Street showdown came as Scotland’s Brexit secretary Mike Russell warned the withdrawal agreement had created an “emergency” situation that must be stopped. He said it was “unacceptable” and would be “immensely harmful” to Scotland, also dismissing the idea it is “this deal or nothing” as “nonsense” being perpetuated by people who “seem to have lost all sense of reason”. Mr Mundell insisted it was the “best deal that’s available at this time”, however. The row came after the joint ministerial committee meeting in Whitehall yesterday. In turn, Mr Mundell accused the Scottish Government of wanting no deal because “behind the mask this is all about taking forward the independence agenda”. 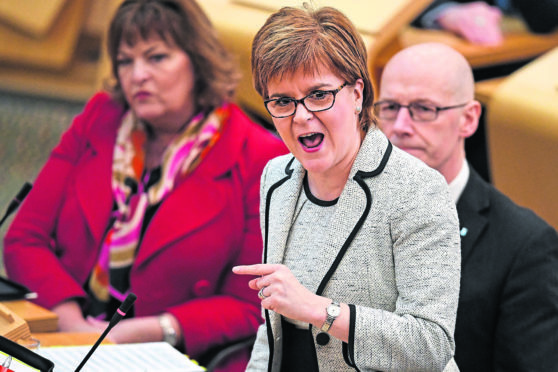 He added: “I can only draw the conclusion that Nicola Sturgeon believes that the chaos and disruption of a no-deal Brexit in just about four months’ time would be the way in which it would best serve her independence referendum agenda. Asked about a second referendum, Mr Russell agreed with SNP Westminster leader Ian Blackford that there’s no greater illustration for Scottish independence than what’s happening now. But he said the “priority” was to stop the deal. Ms Sturgeon, who is also due to meet opposition leaders, said Brexit must not be a “false choice” between Mrs May’s deal and a no-deal outcome. She described “continued, permanent single market and customs union membership for the whole of the UK” as such an alternative.